THE COMMISSIONER OF SCHOOL EDUCATION, A.P has released Rc.No.73/IT-Cell/2016, Dated: 20/04/2016. According to this Rc.No.73 all the teachers in A.P have to update teacher database with correct information. This details will help Teachers while applying for transfers, promotions, awards, No objection certificate for Traveling abroad, claiming Medical Reimbursement etc.All the Regional Joint Director of School Education and the District Educational Officers in the state are requested to monitor the updating of teacher database and take necessary action to complete the process on or before 31-05-2016 without fail. 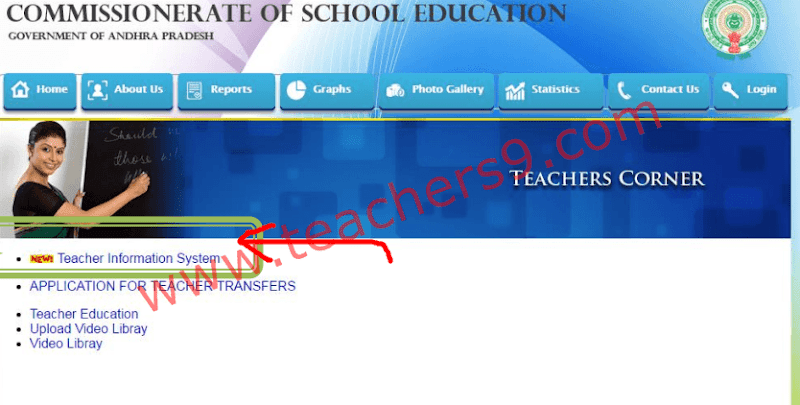 Complete instructions to upload teachers particulars in CSE portal www.cse.ap.gov.in. 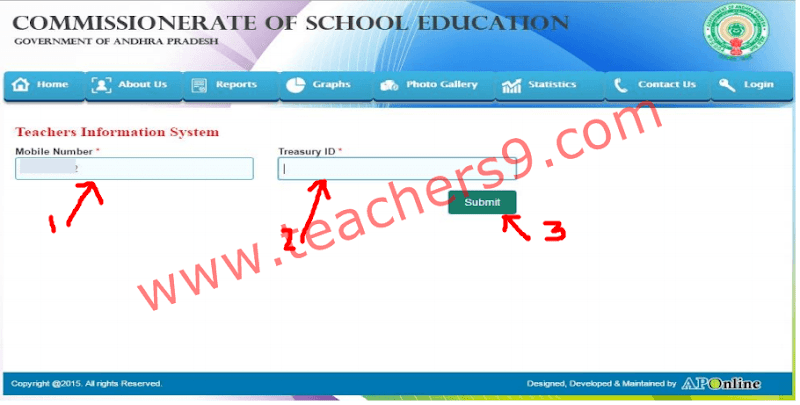 There are two methods to upload teachers details in CSE WEBSITE www.cse.ap.gov. in. 1) INDIVIDUAL UPLOADING 2) UPLOADING AT M.R.C BY collecting required information from teachers in a particular proforma. We have mapped all your mobile phones with your treasury id. If the mobile number you enter is not matching our database, no OTP will be sent. In such cases if you are a primary school teacher, please contact your MEO for OTP, and if you are an Upper Primary School or High School teacher please contact your DyEO. Next following screen will display,Here select Teacher Information. Enter your mobile number that is mapped to your Treasury ID. Then you will be directed to below page. Now enter the OTP that has been sent to your mobile number (which you have entered in the earlier screen). Upload your photograph and click on submit. After clicking on final submit button the process of teachers details uploading in CSE web portal(www.cse.ap.gov. in) was completed. 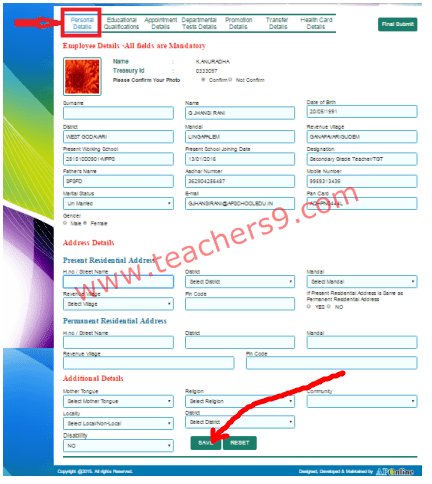 So dear friends I think you understand How to upload the details of teachers particulars in A.P at CSE portal.You may download teachers details personal proforma here. It is useful to upload at M.R.C. Sir Departmental tests ku gezette number telusukovalantey yelaa sir? I came up to 'step 4'. But I did not get OTP. Whom should I contact for this issue? Dear Mr. Manohar please re log in to your account in cse web portal and upload your transfer details freshly. By mistakenly i entered no of transfers as wrong in TRANSFER DETAILS TAB and saved.Now i want to modify but i am unable do.Also i tried with re login in web portal ,that one also not helpful to me.So can u help on that one? sir, I have given the final submission without taking a print of it. how to get a print of it sir? Sir, category of the post in my first appointment is wrong in that. I have submitted final submission... Now how to update category of the post sir?